The Jetstream Tidal Lagoon is a new concept using Tidal Power, enabling extended power generation windows. Due to the aerofoil-shaped lagoon walls, the increased flow around these walls are able to operate our Venturo zero-energy pumps. These pumps are installed around the lagoon outer wall, pumping water out of the lagoon on the rising tide, and into the lagoon on the falling tide. Using arrays of solar panels mounted on floating pontoons inside the confines of the impoundment further enhances power generation. 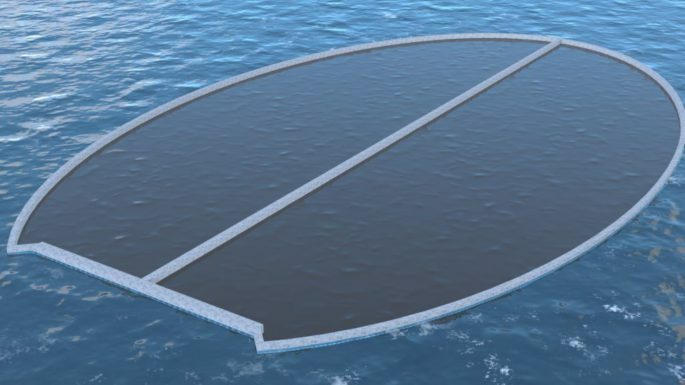 Water Powered Technologies Jetstream concept increases water transfer to and from the lagoon on both incoming and outgoing tides, resulting in higher differential generating heads and thus sustained power generating windows. This water transfer is carried out by a variation of our proven Venturo zero-energy pump technology. A large number of Venturos are attached to the periphery of the lagoon’s outer wall, which is a smooth, aerofoil shape. The pumps are operated by the increase in the water flow around the aerofoil shape which can be up to 25%. On the incoming tide, the Venturo pumps operate to expel water from the lagoon and on the outgoing tide they pump water into the lagoon. Tidal water is prevented from flowing into and out of the lagoon by the bi-directional turbines’ wicket gates. The turbine gates are opened at around high and low tide and closed at times inbetween. This ensures that the turbines start generating power at the maximum height differential which optimises efficiency and the power generation windows. The lagoon is divided into two parts so that turbine maintenance can be carried out whilst still being able to generate power.